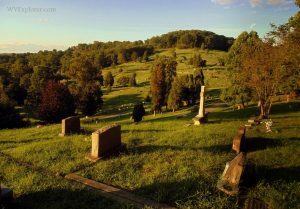 Spring Hill Cemetery, in Charleston, West Virginia, in Kanawha County, is the largest cemetery complex in West Virginia. More than 172 acres of burials are contained in five cemeteries that wrap around two ridges overlooking downtown Charleston. It was listed on the National Register of Historic Places (PDF) in 1985. Cemeteries within the complex including Spring Hill Cemetery (established 1869), Mountain View Cemetery, B’nai Israel Cemetery (Jewish), Lowenstein Cemetery, and Mount Olivet Cemetery (Roman Catholic). Many famous and influential West Virginians are interred in the complex, including the graves of West Virginia Governors William A. MacCorkle (1857-1930) and George W. Atkinson (1845-1925). Spring Hill Cemetery is a popular destination for runners and walkers, and many regularly visit the complex. A tour of historic graves and a tour of tree species are offered online through the cemetery foundation. The cemetery is open from dawn until dusk.